Il Masterclass sarà diviso in due stage: tecnica vocale e interpretazione. Il primo giorno l'insegnante ascolterà un pezzo preparato dai partecipanti per capirne il livello tecnico e il repertorio. Le Arie potranno essere cantate in qualunque lingua. Il programma dettagliato sarà inviato via mail ai partecipanti dopo l'iscrizione al masterclass. Tutti i partecipanti si esibiranno nel concerto finale presso la Cattedrale di San Paolo (La Valletta), il 14 Settembre alle 19:00. Alla fine del corso ogni partecipante riceverà un certificato di partecipazione. Dietro approvazione dei partecipanti, il concerto finale sarà filmato e pubblicato online. Tra tutte le voci ascoltate, verranno scelti anche nuovi cantanti per le prossime produzionei di Florence Opera. 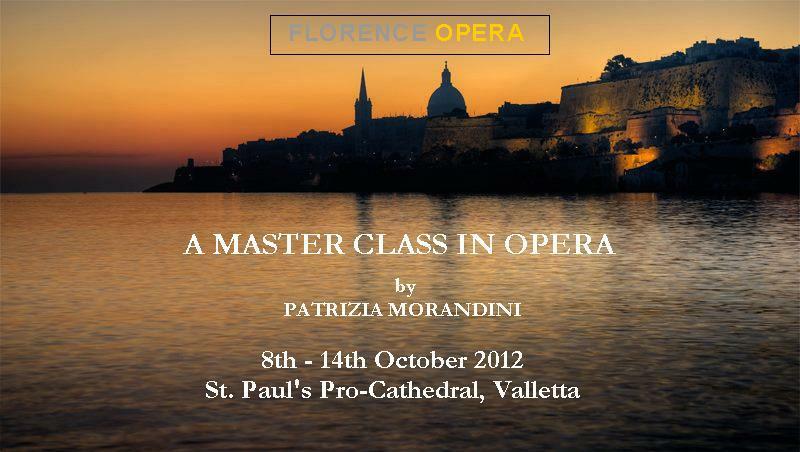 The master class will take place at St. Paul's Pro-Cathedral, Valletta over a period of 7 days; 8th - 14th October 2012. The course is open to all vocal categories, and can be attended by singers and auditors. The master-class will be divided in two stages: vocal technique and interpretation. On the first day the tutor will listen to a piece prepared by the participants in order to understand the skill level and repertoire of the singer. Together with the application form you are also requested to provide your CV, a photograph and optionally an audio or video recording. All the demo audio-video optional has to be sent via email to: master@florenceopera.com. Arias can be sung in any language. A detailed programme of the master class will be email to participants after subscription deposit/payment is received. All participants will perform at the Final Concert which will take place at St. Paul's Pro-Cathedral on Sunday 14th September at 7.00 pm. At the end of course all students will be presented with a certificate of participation by Florence Opera. Florence Opera will give an extensive promotion to all events through major local media. Subject to participants' approval, the final performance will be filmed and published online. Florence Opera has the right to determine the minimum number of subscribers for the master class to take place. Subscriptions will only be considered valid when the deposit has been paid, which payment should be effected within three working days.